I know it doesn’t seem like it with temps in the upper 90’s (at least where I live) but Halloween will be here before you know it. 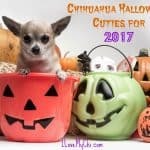 If you and your dog celebrate Halloween, I have some adorable costume ideas for you! 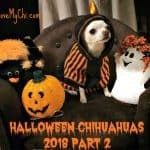 Feel free to click on the links or photos of any costumes that interest you. I do get a small commission if you decide to buy but it won’t cost you anything extra. 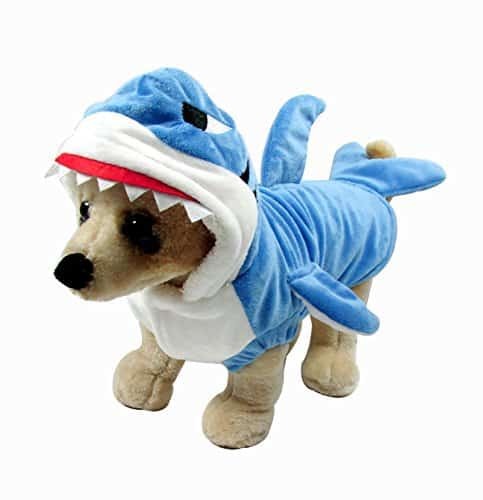 This shark costume is affordable and looks pretty comfortable. I think my Kilo would actually wear this without trying to shake it off. It’s available in sizes Extra Small, Small, Medium, Large, and Extra Large. Most people said it was true to size but one person said it was too big so be sure to check the measurement/sizing chart (found under Product Description) on this before ordering. Check it out here. 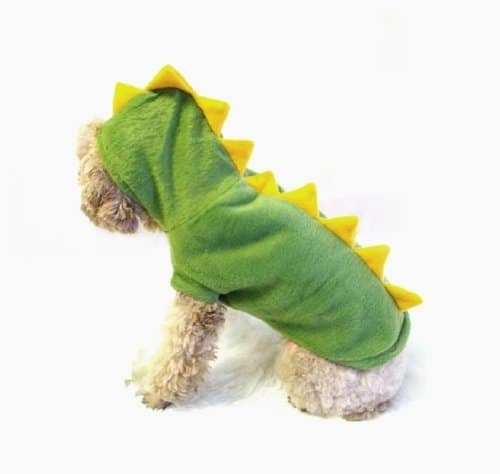 I really like this dinosaur costume because it can be worn as a jacket and not just for Halloween. Like the previous costume, it’s comfy and warm. There was only one review for this but the reviewer said it was well made. 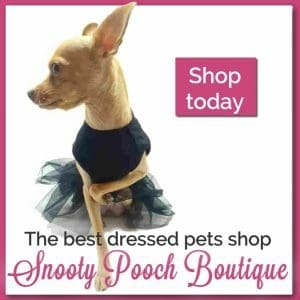 If your dog will wear a shirt, but not a costume, this is a great option for you. This shirt is very reasonably priced too. It’s available in Extra Small, Small, Medium and Large and the measurements are in the Product Description (fortunately in inches and centimeters). Get it here. Sorry this photo is blurry. 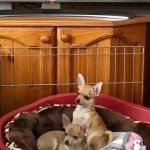 It was really small on Amazon and when I enlarged it, it got blurry. Also just ignore the groom costume (you can find one below). 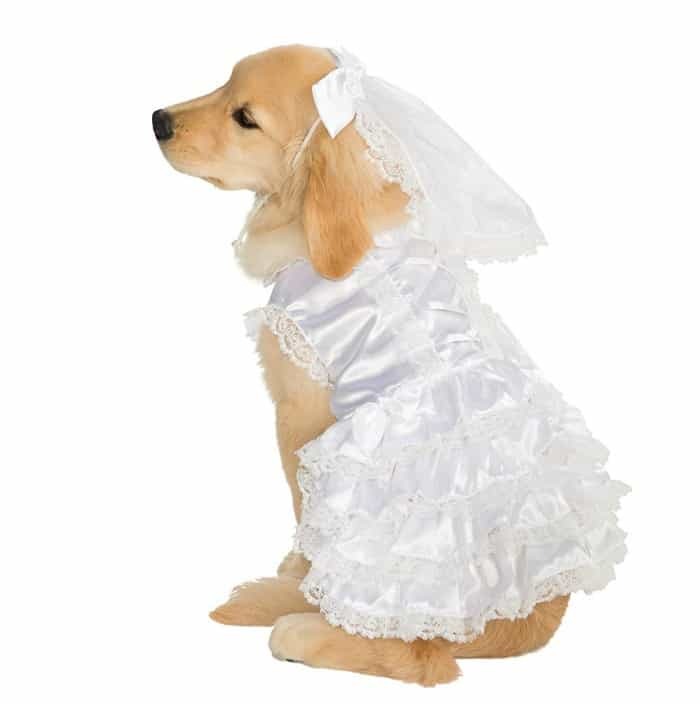 This bridal gown just comes in extra small and fits dogs between 3 and 7 pounds. 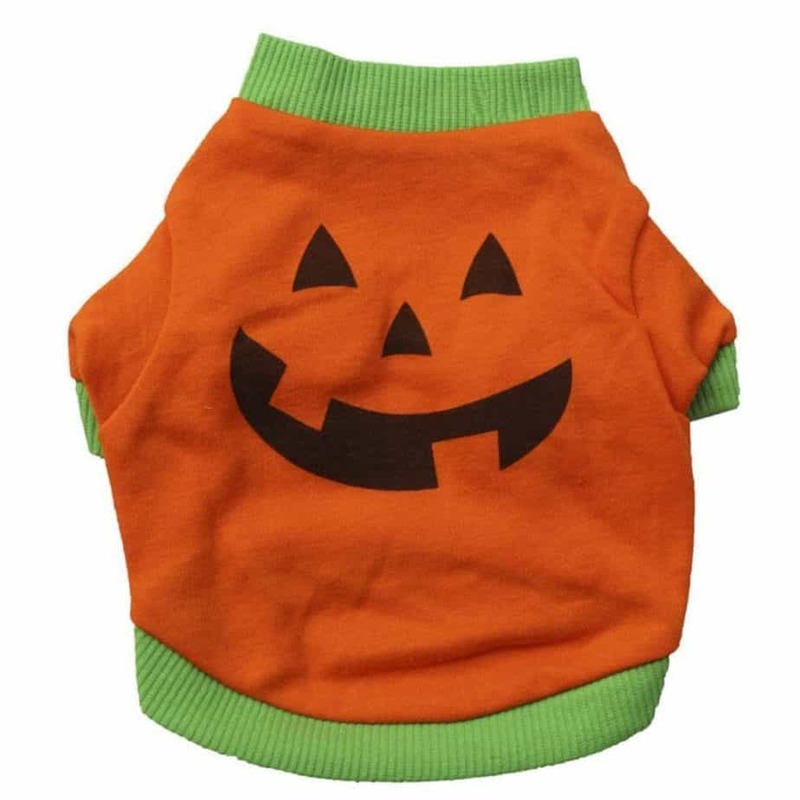 Not only would this be cute at Halloween but if you had a formal affair such as a wedding you wanted to bring your dog too, this would be perfect for them. 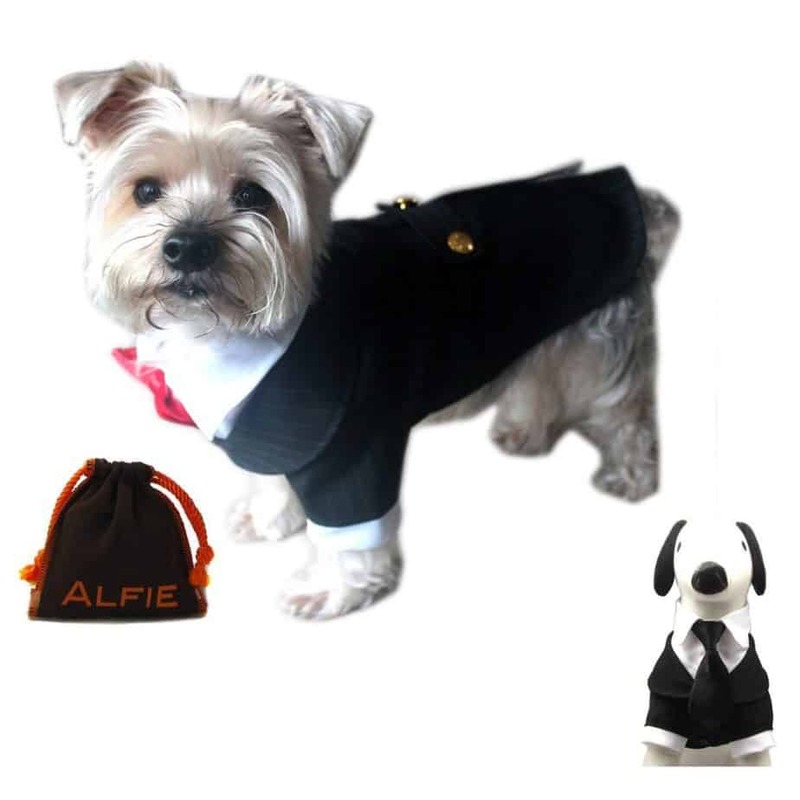 This tuxedo got rave reviews on Amazon. It comes in 6 sizes: Extra Small, Small, Medium, Large, Extra Large and Extra Extra Large. Look in the Product Description to get the measurements. 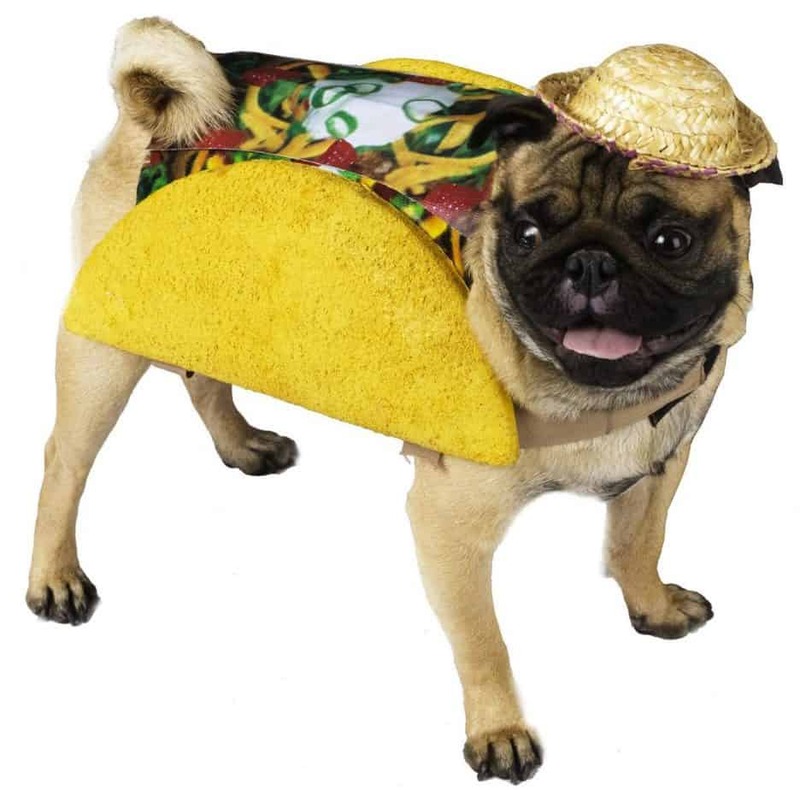 I know it’s cliche but a taco costume is PERFECT for a Chihuahua, isn’t it? 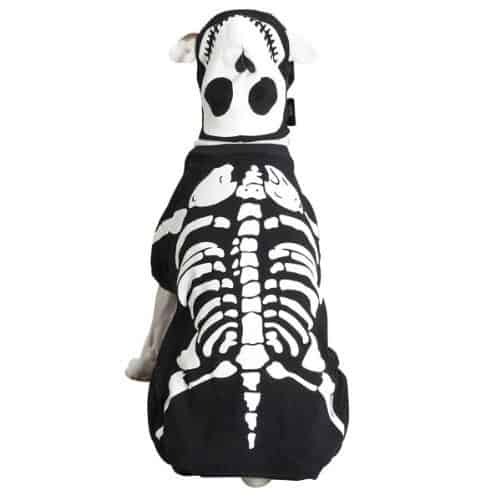 This costume is available in Small and Extra Small. 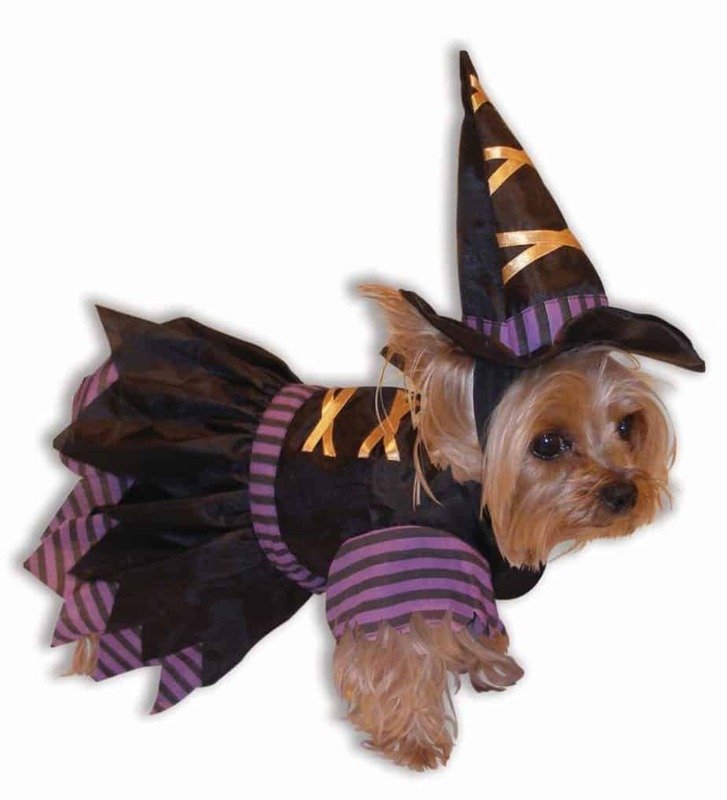 This has to be one of the cutest witch costume for little dogs that I have seen in a long time. It comes in size Small. Check it out here. 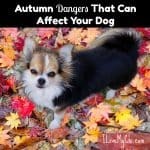 Is your dog a super hero? 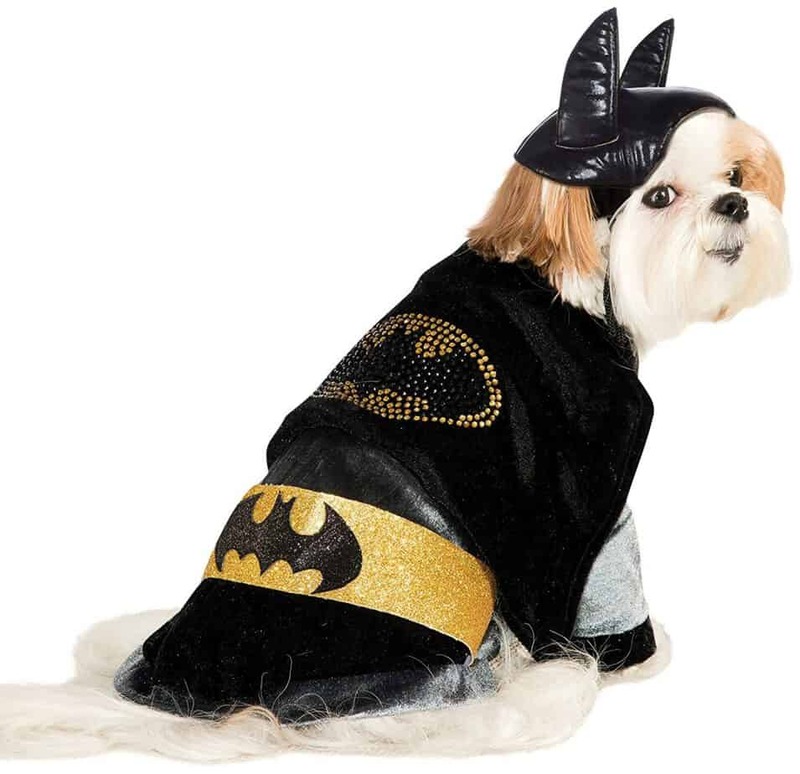 Then maybe he would like to be Batman for Halloween. It comes in Small, Medium, Large and Extra Large. 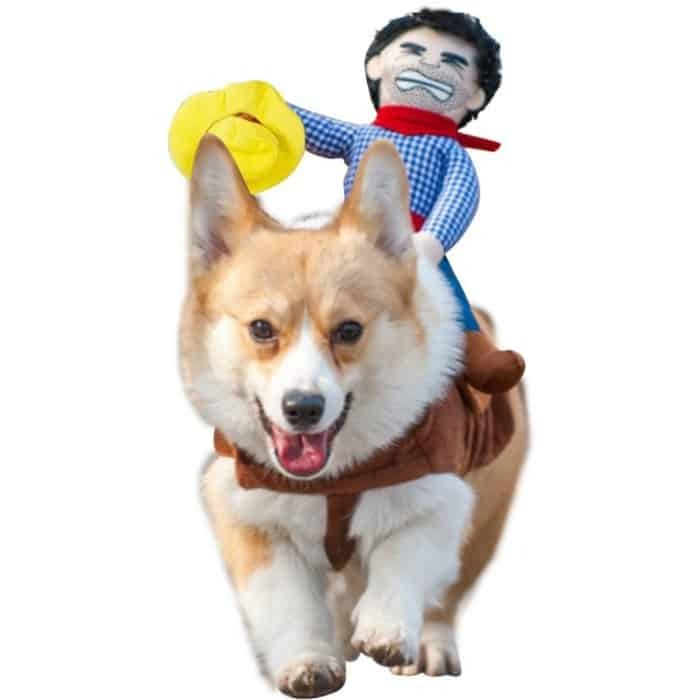 Such a funny costume, isn’t it? And it got great reviews. Get it here. 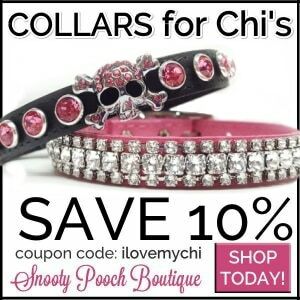 Yes, I know this is shown on a cat, but it would be adorable on a dog too, especially Chihuahuas wouldn’t it? 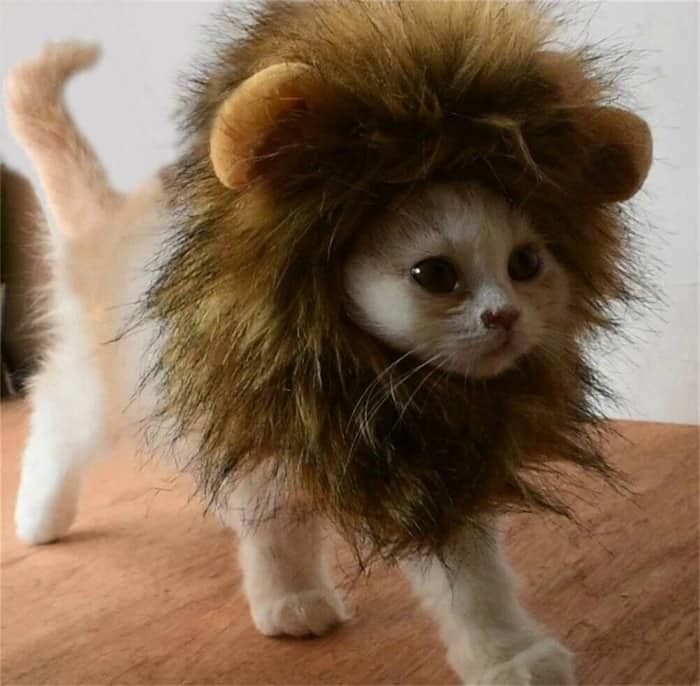 After all, they think they are as ferocious as lions. It should fit most small dogs and cats of course. Check it out here. So that’s it. 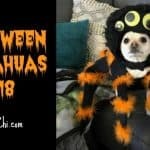 If you dress up your pup for Halloween, I’d love to see a photo. Share it in the comments! 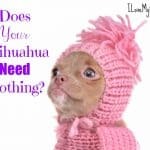 Does Your Chihuahua Need Clothing? Thanks the bad breath & nail clipping are my biggest issues. 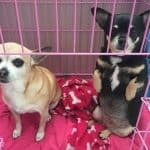 My chi will be 19 yrs. old in the fall & has all his teeth, the vet was amazed. it takes two to hold, one to clip his nails. he turns into Cujo if anyone tries to cut his nails. He draws blood he means business. You are welcome Joan. If you try the steps from the nail cutting article, let me know how they work for you. 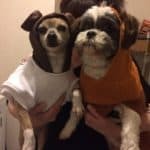 This is my chi Lilly & her brother Picasso (a shih tzu) dressed up as Princess “Chi-Leia” & “Ewok-Tzu”. 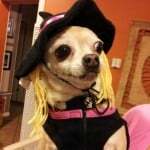 Sadly, Lilly despised the hair-buns & refused to move an inch until I pulled the hood back. 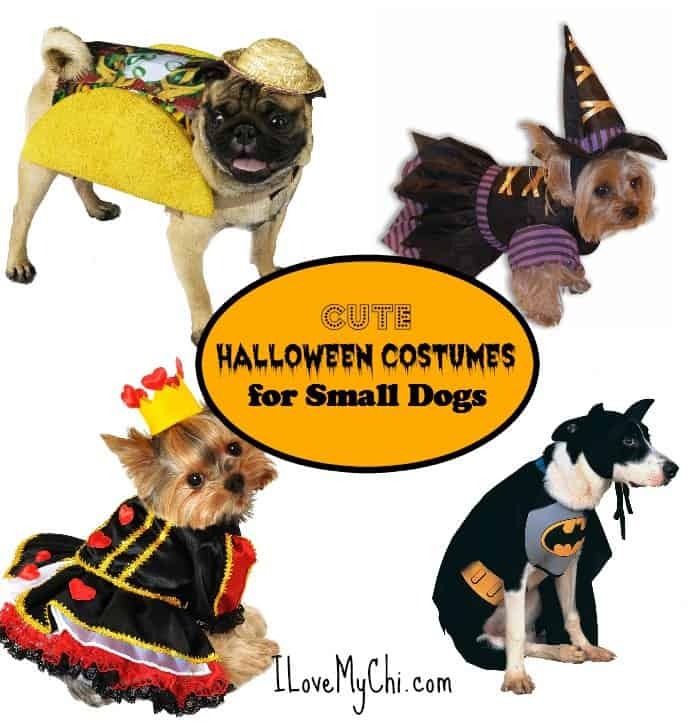 But, they make the cutest costumes these days for pups…& I thought these were just perfect for my kids! Thanks for sharing all these great costume ideas! They are so cute Shan! 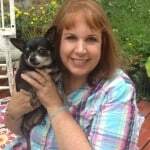 Congrats to Sybill on having two beautiful furbabies as CHI OF THE WEEK! Our loveable one-eyed 1.5 year newly rescued chi. Were you trying to leave a photo Taco Bill? It didn’t come through. They are so cute Hans! I bet they keep you busy.